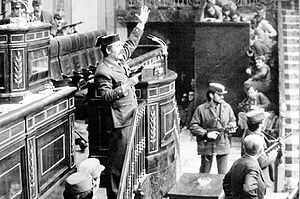 Brief remarks concerning the meaning of the word “autonomy” in the context of political struggles since the time of Marx, with special emphasis on the period of the Spanish Transition to democracy in the 1970s. The word “autonomy” has been used in connection with the cause of proletarian emancipation for many years. In The Communist Manifesto Marx defined the workers movement as “the autonomous [independent] movement of the immense majority in the interest of the immense majority”. Later, Proudhon, reflecting on the experiences of 1848, asserted in On the Political Capacity of the Working Classes (1865) that for any class to act in a specific manner it would have to fulfill three requirements for autonomy: it should be conscious of itself, that as a consequence of this consciousness it should affirm “its idea”, that is, that it should be aware of “the law of its existence” and that it should know how “to express it in words and to explain it by means of reason”, and that it should draw practical conclusions from this idea. Both Marx and Proudhon were witnesses to the influence of the radical bourgeoisie on the ranks of the workers and tried to get the proletariat to politically separate itself from this influence. In 1890, in London, there was a group of German anarchist exiles whose journal was called Autonomy, which emphasized individual liberty and the independence of political groups. In 1920 the Marxist Karl Korsch designated “industrial autonomy” as a higher form of socialization which he would later discover in the libertarian collectives of 1936. The theoretician of workers councils, Pannekoek, spoke instead of “self-activity” (like Marx), referring to the independent action of the workers, their self-government, which is the same as workers autonomy. Today, the use of the words “autonomy” or “autonomous” in all kinds of situations and with the most diverse intentions is more a factor of confusion than of clarification. They can be found issuing from the mouth of a member of the civil society movement or a nationalist, pronounced by a college student follower of Toni Negri or spoken by a squatter…. The words therefore define different realities and respond to distinct concepts. The Autonomous Anticapitalist Commandos took that name in order to indicate their non-hierarchical character and to distance themselves from the ETA. The gelatinous Castoriadis (in conformance the dictionary definition of the word) called the responsible citizen of a society capable of providing itself with its own laws “autonomous”, a kind of bourgeois with angel’s wings, but in other milieus one calls oneself “autonomous” if one does not want to define oneself as an anarchist, in order to avoid the reductionism implied by that term, and the follower of an Italian fashion trend which is manifested in various and quite dissimilar versions, the worst of them being the one invented by professor Negri in 1977 when he was a creative Leninist, is also an “autonomist”…. Workers autonomy possesses an unequivocal meaning which was revealed during a particular period of real history: as such, it appeared on the peninsula at the beginning of the seventies as the fundamental conclusion of the class struggle of the previous decade. It was not by chance that when the workers began to radicalize their movement they demanded “autonomy”, that is, their independence from external representatives, whether from the vertical bureaucracy of the state, the opposition parties or the clandestine trade union groups. For them this meant acting in common, directly managing their own affairs with their own rules, making their own decisions and defining their strategy and their tactics in the struggle: in short, constituting themselves as a revolutionary class. The modern workers movement, i.e., the one which appeared after the civil war, arose during the sixties, once the movement that was represented by the CNT and the UGT had run its course. Most of the workers who comprised it were from a peasant background, having immigrated to the cities where they resided in the outskirts of the urban areas in “cheap housing” in apartment blocks and shacks. After 1958, when Franco’s first Development Plan was implemented, industry and services underwent a strong burst of growth which was translated into a generalized demand for labor. The ensuing depopulation of the countryside and the demise of traditional agriculture were accompanied by the birth of a new type of worker in the urban shantytowns. The conditions of the exploitation of the working population of that era—low wages, long hours, sub-standard housing, long commutes, deficient infrastructure, illiteracy, servile habits—transformed these workers into an abandoned and marginal class which nonetheless knew how to start all over and defend its dignity. Their protest was filtered through the churches and the interstices of the Vertical Trade Union, which were soon both revealed to be stifling dead ends. In Madrid, Vizcaya, Asturias, Barcelona and other cities, the workers, together with their representatives elected within the framework of the law of the Francoist factory committees, began to meet in assemblies to address labor issues, establishing an informal network of contacts which constituted the basic framework for the original “Workers Commissions”. These commissions operated within the existing legal framework although, given the limitations of the latter, often exceeded these bounds or ignored them altogether when necessary. The informal structure of the Workers Commissions, their self-established reformist limitations and their Catholic-Vertical cover were at first effective during an intensively repressive era; they launched important strikes that aroused a new class consciousness under the shadow of the Law of Collective Agreements. But as class consciousness became more pronounced, the workers struggle was not understood simply as a fight against the boss, but as a fight against capital and the state in the form of Franco’s dictatorship. The final goal of the struggle was nothing less than “socialism”, or the appropriation of the means of production by the workers themselves. After May ’68, the word used was “self-management”. The Workers Commissions had to assume this goal and radicalize their methods by opening their doors to all the workers. The Franco regime soon became aware of the danger and suppressed the Workers Commissions; the militant workers parties—the PCE and the FLP—soon noticed their usefulness as political instruments and recuperated them. The only possibility for trade unionism was that offered by the regime, which was why the PCE and its Catholic allies took advantage of the opportunity by constructing one trade union within the other, official one. The increasing influence of the PCE after 1968 bolstered the reformist trends in the Commissions and helped prevent their radicalization. The consequences would have been grave had the PCE’s implantation been more deeply rooted: on the one hand, the workers representation was separated from the assemblies and escaped the control of the rank and file. Action became the exclusive prerogative of the supposed leaders. Furthermore, the workers movement was circumscribed by a legalist practice, avoiding any resort to strikes whenever possible, and the strike was only used as a demonstration of the leader’s power. The workers struggle lost its recently acquired anti-capitalist character. Finally, the struggle was depoliticized as the communists assumed control of the leadership of the movement. The political goals were changed from those of “socialism” to those of bourgeois democracy. The script was clear: the “Workers Commissions” had become interlocutors for the bosses in labor negotiations, totally bypassing the workers. This supposed trade union dialogue was nothing but the reflection of the institutional political dialogue pursued by the PCE. Stalinist reformism did not emerge victorious, but provoked a split in the workers movement by dragging the most moderate and supine fraction of the workers into bourgeoisification; however, class consciousness had developed sufficiently to allow the most advanced sectors of the working class to advocate more suitable tactics, first within and then outside of the Commissions, triggering the formation of more combative rank and file organizations known, depending on their location, as “circles”, “commission platforms”, “workers committees” or “autonomous workers groups”. For the first time, the word “autonomous” was used in the Barcelona area to emphasize the independence of a group which supported direct democracy against the parties and any organization alien to the class. Furthermore, since a legal loophole permitted the formation of neighborhood associations, the struggle spread to the residential districts and penetrated the arena of everyday life. In this case as well, in the shantytowns and poorer neighborhoods, the question was posed concerning whether to remain within the institutional framework of the existing groups or to organize neighborhood committees and to treat the neighborhood assembly as a representative institution. The Franco regime’s resistance to even the slightest reformist proposal made the strikes that followed the 1969 construction workers strike in Granada, as savage and as hard-fought as they always were at that time, impossible to conduct under the aegis of legality that the Stalinists wanted to preserve. The anti-capitalist workers understood that, instead of waiting at the doors of the CNS to find out the results of the measures taken by their legal representatives, what had to be done was to convene assemblies in the factories themselves or their neighborhoods and elect their delegates there, delegates that were not to be permanent, but revocable at any time. If only in order to resist repression a delegate had to be elected for the period between assemblies, and a strike committee’s mandate was valid for as long as the strike lasted. The assembly was sovereign because it represented all the workers. The old tactic of forcing the boss to negotiate with “illegal” assembly delegates, by spreading the struggle to other branches of industry or by transforming the strike into a general strike by means of “pickets”, that is, by “direct action”, found supporters every time. Along with solidarity, class consciousness made great progress, while demonstrations ever more scandalously confirmed this advance. The workers had lost their fear of repression and confronted it in the streets. Each demonstration was not only a protest against the bosses, but, by constituting a breach of public order, was also a challenge to the political authority of the state. If the proletariat wanted to move forward it had to separate itself from all those who spoke in its name—who were legion due to the proliferation of groups and parties to the left of the PCE—and who attempted to lead it. The proletariat had to “self-organize”, or “conquer its autonomy”, as was said in May 1968. People then began to speak of “proletarian autonomy”, of “autonomous struggles”, meaning struggles which took place on the margins of the parties, and of “autonomous groups”, groups of revolutionary workers carrying out autonomous practical activities within the working class with the clear objective of contributing to the class’s “becoming conscious”. Even taking their historical and ideological differences into account, the autonomous groups could only be just like the “affinity” groups of the old pre-1937 FAI. The early seventies saw the conclusion of the industrialization process undertaken by the Francoist technocrats, with the undesired result of the crystallization of a new working class which was increasingly more convinced of its historic possibilities and which was ready to fight. The fear of the proletariat compelled the Franco regime to implement a perpetual authoritarianism, against which even the new bourgeois and religious values conspired. After the death of the dictator, the repression was relaxed just enough to allow the outbreak of an unstoppable strike wave all over the country. Stalinist trade union reformism was completely swamped. The constant assemblies held to resolve the real problems of the workers on the job, in their neighborhoods and even in their homes, did not face a bureaucratic apparatus that could restrain them. The links between the Commissions and communist party leaders were only tolerated when they did not cause an inconvenience, as the latter were obliged to convene assemblies if they wanted to exercise even the least control over the movement. The working class masses began to become aware of their role as the principle subject in the unfolding events and rejected a political-trade unionist regulatory approach to the problems of their real lives. In 1976 the ideas of self-organization, generalized self-management and social revolution could easily express the immediate desires of the masses. The road was still open. The social dynamic of the assemblies encouraged the workers to take their affairs into their own hands, beginning with their own autonomy. This autonomous mode of action, which led the masses to dare to venture onto what had previously been territory that was off-limits, was sure to bring about real panic in the ruling class, which machine-gunned the workers in Vitoria, liquidated the conservatives’ version of reform of Francoism, dissolved the Vertical Trade Union along with the Commissions within it and legalized the parties and trade unions. The Moncloa Pact signed by all the parties and trade unions was a pact against the assemblies. We shall not pause here to narrate the subsequent vicissitudes of the assembly movement, or to count the number of fallen workers; it suffices to say that the movement was defeated in 1978 after three years of arduous struggles. The Labor Law promulgated by the new “democratic” regime in 1980 constituted a legal condemnation of the assemblies. The trade union elections provided a contingent of professional representatives who, with the assistance of the accommodationist assemblyists, hijacked the leadership of the struggles. This does not mean that the assemblies disappeared; what actually disappeared was their independence and their autonomy, and this deviation was followed by an irreversible degradation of class consciousness which not even the resistance to the economic restructuring of the eighties could halt. The theory that was best able to serve workers autonomy was not anarcho-syndicalism, but councilist theory, of the kind formulated by the Dutch and German revolutionary communists who drew upon the Russian and German experiences. The structure of the “unitary trade unions” corresponded to a long-superseded stage of Spanish capitalism in which small businesses were predominant and a peasant majority subsisted on the margins. Spanish capitalism was then expanding and the trade union was an eminently defensive proletarian institution. Those who are acquainted with pre-civil war history are aware of the problems which were caused by the trade union mentality when the workers had to defend themselves from the bosses’ terrorism between 1920 and 1924, or when they had to resist the state corporative institutions that the Primo de Rivera dictatorship sought to impose, or during the years 1931-1933 when the workers tried to go on the offensive by means of insurrections. Organizing trade unions in 1976, even “unitary” trade unions, in a highly developed capitalism that was undergoing a crisis, meant integrating the workers into a shrinking labor market and carrying on with the mission of the Workers Commissions of the Franco regime. Syndicalism, even if it claims to be revolutionary, has no choice but to carry out defensive actions within capitalism. “Direct action” and “direct democracy” were no longer possible in the shadow of the trade unions. Modern conditions of struggle required another form of organization adapted to the new times because, when faced with a paralyzed capitalist offensive, the proletariat must go on the offensive. The assemblies, pickets and strike committees were the appropriate unitary institutions. What they needed in order to become Workers Councils was more widespread and more consistent coordination and the consciousness of what they were doing. It could have happened at any moment: in Vitoria, Elche, Gavà…but it was not enough. To what extent, then, did councilist theory, as the most realistic expression of the workers movement, assist the “class called to action” to become conscious of the nature of its project by indicating the way forward? Very little. The theory of the councils had many more unconscious practitioners than actual supporters. The assemblies and representative committees were spontaneous organs of the struggle which were not yet fully conscious of their simultaneous role as effective organs of workers power. As the strikes spread, the functions of the assemblies were enlarged and embraced questions that did not involve the workplace. The power of the assemblies affected all the institutions of Capital and the State, including the parties and the trade unions, which worked together to neutralize it. It seems that the only ones who were not aware of this power were the workers themselves. The slogan, “All power to the assemblies”, meant no power to the parties, the trade unions and the State, or else it was meaningless. By not seriously examining the problems to which its own power gave rise the workers offensive never quite gelled. It was easier for the workers to renounce their primordial antipathy to trade unionism and to avail themselves of those customary intermediaries between Capital and Labor, the trade unions. In the absence of any revolutionary perspectives the assemblies became useless and boring and the Workers Councils unviable. The Council system can only function as a form of struggle of a revolutionary working class, and in 1978 that class turned its back on a second revolution. An enormous strategic error that undoubtedly contributed to the defeat was the decision by the majority of the autonomous activists in the factories and neighborhoods to participate in the reconstruction of the CNT with the naïve expectation that they would thereby create a rallying point for all antiauthoritarians. A mountain of collective coordination evaporated. The experiment quickly failed but the price paid in demobilization was high. The vulgar workerism that was manifested in the “class autonomy” tendency also contributed to the defeat, with its support for collaboration with the trade unions and submerging the assemblies in the trade union morass of separate partial reforms and the self-management of misery (transforming bankrupt factories into cooperatives, running “autonomous” electoral candidates, supporting mixed trade union-assembly representation, using conciliatory language, etc.). It is characteristic of those times that the revolutionaries were correct in saying that the greatest enemies of the proletariat posed as supporters of the assemblies in order to more easily sabotage them. This was true of dozens of groupuscules and “movements”. “Italian-style” autonomy had little influence, however, since its importation as a Leninoid ideology took place at the end of the period of the assemblies and its intoxicating effects took hold post festum. In reality, what was imported from Italy were not the practices of the 1977 movement in various Italian cities which was baptized as “Autonomia Operaia”, but the most backward and spectacular aspect of that “autonomy”, which corresponded to the decomposition of Milanese Bolshevism—Potere Operaio—and especially the literary masturbations of those whom the press celebrated as its leaders, i.e., Negri, Piperno, Scalzone…. In short, very few groups were consistently engaged in the active defense of workers autonomy, besides the Workers for Proletarian Autonomy (libertarian councilists), a few factory collectives (e.g., those at Fasa-Renault, Roca Radiators, Barcelona longshoremen….) and the Autonomous Groups. We shall pause now to examine the latter in more detail. The “1,000” organization, or MIL (Movimiento Ibérico de Liberación), a pioneer in so many things, gave itself the name of “Autonomous Combat Groups” (GAC) in 1972. The armed struggle made its debut with the purpose of helping the working class, not replacing it. They took the name “autonomous” from the groups that were engaged in 1974 to support and win the release of the MIL prisoners—which the police called the OLLA—and the groups that followed in their footsteps in 1976, which, after a debate in the Segovia prison, adopted the name “Grupos Autónomos” or GGAA (in 1979). Although hindsight is, as they say, 20-20, we must nonetheless point out that the pretense of being the “armed faction of the revolutionary proletariat” was not just debatable but also false as a matter of principle. All the groups, whether or not they engaged in armed struggle, were separate groups that only represented themselves, which is what “autonomous” really meant in that context. This kind of autonomy, by the way, would have had to question the existence within the MIL of a specialization of tasks that divided the membership into theoreticians and activists. The proletariat represents itself as a class through its own institutions. And it never takes up arms except when it is necessary, when it is ready to destroy the state. But in that case, not a fraction but the whole class is armed, forming its militias, “the proletariat in arms”. The existence of armed groups, even if they place themselves at the service of wildcat strikes, contributes nothing to the autonomy of the struggle, insofar as they are composed of people who are at the margins of the assemblies’ collective decision making and outside their control. They comprised a separate power and rather than helping the assemblies they could have posed a threat to them if they were infiltrated by spies or provocateurs. During that phase of the struggle, the pickets were sufficient. The most radical practices of the class struggle were not the expropriations or the fireworks in businesses and government offices. The really radical contributions were those efforts that helped the proletariat to go on the offensive: the generalization of insubordination against all hierarchy, the sabotage of capitalist production and consumption, the wildcat strikes, the revocable delegates, the coordination of struggles, its self-defense, the creation of specifically working class information networks, the rejection of nationalism and of trade unionism, the occupations of factories and public buildings, the barricades…. The contribution to proletarian autonomy made by the groups mentioned above was limited by their voluntarist stance with regard to the question of armed struggle. In the case of the Autonomous Groups, it is clear that they wanted to move among the masses and pursued their maximum radicalization, but the clandestine conditions imposed by the armed struggle isolated them from the masses. They were completely lucid concerning what was needed for the extension of the class struggle, that is, concerning the question of proletarian autonomy. They were acquainted with the legacy of May ’68 and condemned all ideology as an element of separation, even the ideology of autonomy, since in the times of ferment the enemies of autonomy are the first to proclaim their support for autonomy. According to one of their communiqués, the group’s autonomy was “not simply a common practice founded upon a minimum shared framework for action, but was also based on an autonomous theory corresponding to our way of life, of struggle, and our concrete needs”. They took the libertarian “L” to avoid being pigeonholed within the spectacular anarchism vs. Marxism opposition, as well as to prevent their recuperation as anarchists by the CNT, which, as a trade union organization, they considered to be bureaucratic, accommodationist and tolerant of the existence of wage labor and therefore of capital. They had no intention of being permanent organizations like the parties because they rejected power; all truly autonomous groups organized for certain concrete tasks and dissolved themselves when these tasks were concluded. The repression abruptly brought them to an end, but the nature of their practice was revealed as much by their exemplary, and therefore edifying, errors as by their successes. An abyss separates the proletarian milieus of the sixties and seventies from today’s globalized and technology-saturated world. We are living in a radically different reality built upon the ruins of the previous one. The workers movement has disappeared, so speaking of “autonomy”, whether Iberian or any other kind, makes no sense if by doing so we are trying to attach ourselves to a non-existent image of the proletariat and to build an illusory program of action upon that image based on someone else’s shattered ideology. In the worst case this would imply the resurrection of the Leninist cadaver and the idea of the “vanguard”, which are diametrically opposed to autonomy. Nor is autonomy a matter of amusing oneself in cyberspace, or in the “movement of movements”, demanding the democratization of the established order by participating in the institutions of the would-be representatives of civil society. There is no civil society; that society has been broken up into its constituent elements, the individuals, and the latter are not only separated from the results and the products of their activity, but they are also separated from one another. All the freedom which capitalist society is capable of offering rests not upon the association of autonomous individuals but upon their separation and ever more complete dispossession, so that an individual does not discover a means to obtain his freedom in another individual, but a competitor and an obstacle. This separation is being consummated by digital technology as virtual communication. In order to relate to one another, individuals depend absolutely on technological means, but what they get is not real contact but a relation in the aether. In its most extreme form, the individuals who are addicted to such equipment are incapable of carrying on direct relations with their own kind. Information and communications technologies have given new life to the old bourgeois project that sought to achieve the total separation of individuals from one another and have in turn spawned the illusion of individual autonomy thanks to the network function which these technologies have made possible. On the one hand, they create an individual who is totally dependent upon machines, and therefore neurotic and perfectly controllable; on the other hand, they impose the conditions in which all social activity takes place, they define its rhythms and demand a permanent adaptation to change. Therefore, what has conquered autonomy is not the individual but technology. Nonetheless, if individual autonomy is impossible under the current conditions of production, the struggle for autonomy is not impossible, although it must not be reduced to a strategy for opting out of the technologically equipped capitalist mode of survival. Refusing to work, to consume, to use electronic devices, to own a car, to live in cities, etc., in and of itself constitutes a vast program, but survival under capitalism imposes its rules. Personal autonomy is not simple self-sufficiency at the cost of the isolation and marginalization of those who escape from the cell phone and the email. The struggle against these rules and constraints is today the ABC of individual autonomy and can be pursued in many ways, all of them legitimate. Sabotage will be supplemented by learning a dying craft or practicing barter. As for collective action, conscious mass movements are impossible today, because there is no class consciousness. Masses are exactly the opposite of classes. Without a working class it is absurd to speak of “workers autonomy”, but it is not absurd to speak of autonomous groups. Current conditions are not so disastrous as to prevent the organization of groups for the purpose of carrying out concrete defensive actions. The advance of spectacular capitalism is always effected by means of aggression, which must be answered wherever possible: against High Speed Trains, Wind Farms, incinerators, golf courses, dams, sports stadiums, highways, power lines, vacation developments, ski resorts, shopping malls, real estate speculation, temporary and part time work, genetically modified organisms…. It is a matter of establishing lines of resistance from which an environment that is opposed to capitalism can be reconstructed, in which revolutionary consciousness will once again crystallize. If the world is not ready for grand strategies, if it is instead ready for guerrilla actions, then the most suitable organizational formula is that of autonomous groups. This is the kind of autonomy that is of interest. Transcript of two presentations delivered on January 23 and February 10, 2005 in Barcelona.